Last week, South Korean President Moon Jae-in embarked on a pre-scheduled tour of three Southeast Asian countries. Though the trip was just one of many interactions within Seoul’s ties with Southeast Asian states, it nonetheless put the spotlight on the Southeast Asia component of the Moon administration’s ‘New Southern Policy’ and what it means for South Korea’s development of its relations with Southeast Asia and ASEAN during an important year for relations. As I have noted before in these pages, while South Korea’s interest in Southeast Asia and ASEAN is far from new as evidenced by Seoul’s status as a leading trade and investment partner and a significant regional power, one of Moon’s priorities since coming to office was to increase South Korea’s focus on Southeast Asia and ASEAN still further. While it is still early days in the initiative and it is not without its challenges, we have seen some efforts to translate rhetoric into reality, both in terms of ASEAN-wide efforts as well as developing country-specific ties. 2019 represents a significant year for the development of ASEAN-South Korea relations within Moon’s New Southern Policy, especially with the commemoration of the 30th anniversary of the establishment of dialogue relations between South Korea and ASEAN. A series of interactions have been planned by both sides for the year, including cultural events, people-to-people exchanges, and the holding of both an ASEAN-South Korea Special Summit as well as one between Seoul and the countries of the Mekong region. This past week, we got a glimpse of the ongoing development of the New Southern Policy in 2019 with Moon’s three country ASEAN tour. Moon’s tour – which included stops in Brunei, Malaysia, and Cambodia – spotlighted Seoul’s ongoing efforts to boost ties with these countries within its broader approach towards Southeast Asia and ASEAN. Moon’s trip reinforced the Moon administration’s characterization of the New Southern Policy as a comprehensive, wide-ranging initiative, rather than an exclusively geopolitical one focused narrowly on just a few countries. The selection of countries in visits that Moon and other members of his administration have been across Southeast Asia, rather than focusing on just a few key regional states, and this was no exception. Moon’s visit to Brunei, for instance, was the first visit by a South Korean head of state there in nearly two decades. And though the headlines were dominated by his summit meetings – with Sultan Hassanal Bolkiah, Prime Minister Mahathir Mohamad, and Prime Minister Hun Sen – there were also business-related engagements and sociocultural ones as well, such as a visit he made to Angkor Wat in Cambodia. The timing of Moon’s trip also coincided with the tenth anniversary of the ASEAN-Korea Center, a key platform for promoting exchanges, which helped spotlight that important component of the relationship as well. Of course, Moon’s latest ASEAN tour ought to be seen as just one manifestation of his administration’s wider effort to engage with Southeast Asia as a region and ASEAN as an institution. And there are lingering challenges as well to how the New Southern Policy is being advanced, whether it be the bandwidth issues, follow through on resourcing, and the difficulties of overcoming unevenness in implementation across realms given the breadth of the initiative. 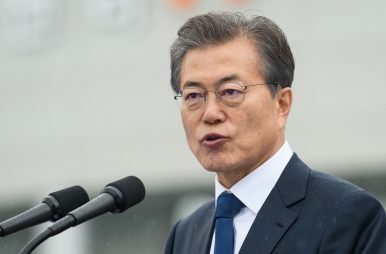 Nonetheless, Moon’s trip reinforced the continued value that his administration continues to see in the New Southern Policy and the willingness of Seoul to invest at the highest levels of the South Korean government to ensure that it continues to have momentum. How this plays out in spite of the uncertainties and challenges that remain will be a key factor in the evolution of ASEAN-South Korea relations during a landmark year for ties.